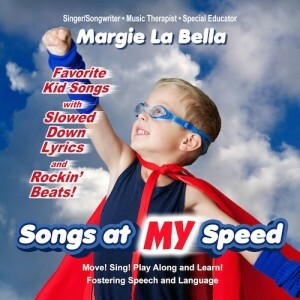 Music therapist and songwriter, Margie La Bella, recently released her latest album, Songs at MY Speed. What is the idea behind your CD? “SONGS AT MY SPEED” has been purposefully crafted to allow kids the opportunity to sing along to their most desired, time-tested songs through the slowing of the lyrics but NOT the drive and movement of the Beat. How did your project start? A speech pathologist friend of mine suggested I make a CD of slowed lyrics because the kids on her case load weren’t able to sing along with their peers during class circle time. Why not? The kids in my school all have speech/language delays and other related issues. Speech is insanely complicated and requires precise manipulation of breath, lips, tongue, jaw, and hard and soft palates. Not only that but the movement has to be in the correct intensity and sound sequential order. So, my music and the slow lyrics allow these kids to plan, sequence and coordinate their whole oral structure. In other words, it allows them extra time to get their words out and be heard! The rehearsal of this all fosters acquisition of new skills. I hear that music and language are related…. That couldn’t be more true! Think of it. Music and language both require auditory perception, give and take, listening and responding, coordinated attention , auditory discrimination, correct volume, pitch (intonation), proper speed, auditory processing and assigning of meaning, syllabic emphasis (think meter/pulse.) The list could go on and on. So is music really on the right hemisphere and language on the left? Music is all over the brain. So many things are happening at once. Singing is linguistic, motoric, muscular, respiratory, cognitive and more. Part of what makes music so powerful is that it is a whole brain experience. (Science used to believe that language was on the left side, but this has changed.) That’s why it is such an immense, vital tool for teaching. Songs teach. This website has it right! If a part of a system is affected, an different part can help make up for it. The brain has so much plasticity, and music is such an intrinsic motivator and reward that if an issue occurs, then a new alternative neuropathway can be established and strengthened. This is what I take advantage of as a music therapist! Any last words? My intent with this CD is to create a situation where kids and their adults explore and play with sounds and language, and where learning happens as a happy (but deliberate on my part) byproduct. Listen to the sample songs and you’ll “see” what I mean! 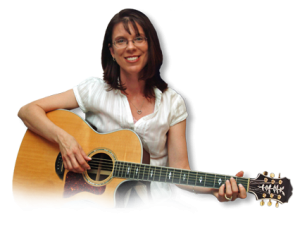 Find all of Margie La Bella’s music here!